Santa Marina Holiday Village is a unique place for a calm, quiet and romantic holiday among evergreen pine trees, flower gardens, park lanes, white sand beaches and blue sea waves. The complex is certain to offer you a great summer experience. 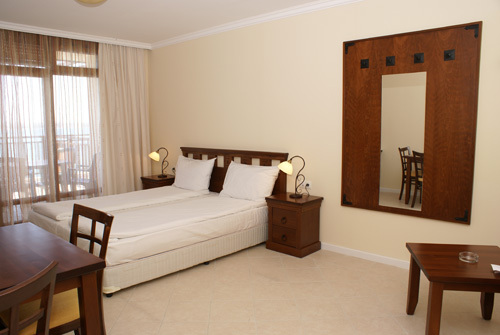 Santa Marina Holiday Village is managed by the Bulgarian hotel chain FPI Hotels & Resorts. 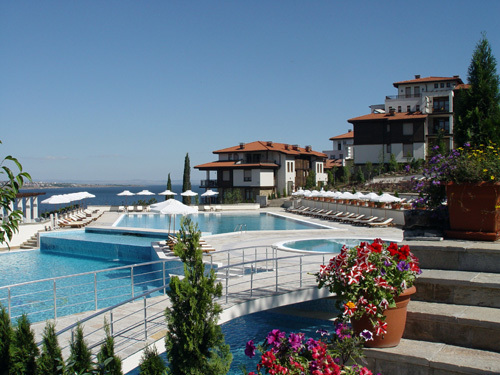 The complex granted the prestigious prize “Building of the Year 2006” in the “Vacation Sites” category as well as „The best sea resort in Bulgaria 2009” award. 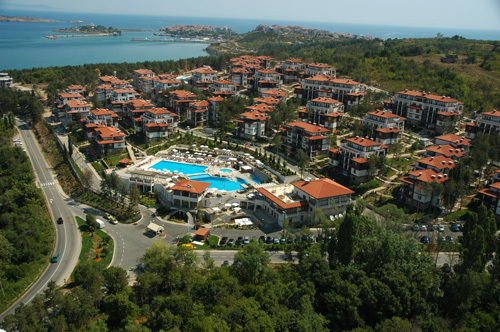 Santa Marina Holiday Village consists of luxury villas located in a pine forest with beautiful sea view. All villas are built in the distinctive Sozopol architectural style with wood and stone elements, white facades and tiled roofs. The complex is being built up at several stages. Currently, there are 1173 modern, comfortably furnished and fully- equipped studios and apartments with one and two bedrooms and a sunny terrace. Apollonia is a stylish restaurant on two levels with a lovely spacious terrace and impressive view to the sea. It offers European cuisine with a special focus on the Mediterranean dishes and fish specialties, as well as an open-air barbeque section. Here you can find tempting culinary suggestions. The wine card will charm you with an exceptional selection. The restaurant is an excellent choice for weddings, family celebrations and business events. It is open all year long and has a total capacity of 330 seats. Casa Mia is a nice pizza restaurant located in Santa Marina Holiday Village. 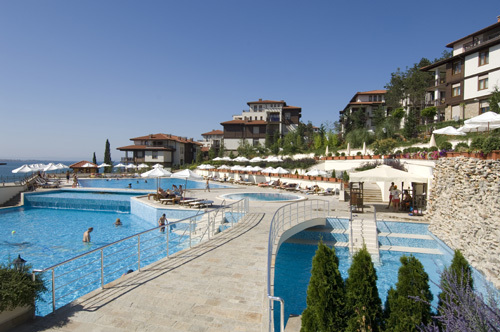 It is situated on a big sunny terrace over one of the complex pools. It offers a variety of furnace-baked pizzas prepared by original Italian recipes and an attractive pasta menu. Additionally, you can choose your favourite wine. The perfect ending comes with a light summer dessert or delicious ice-cream. Here you can order your take-away food. Joy Piano Bar offers variety of drinks along with good music and relaxing atmosphere. Famous Bulgarian musicians and artists entertain the bar guests during the summer nights. There are 3 pool side bars at every swimming pool within the complex. Refreshing exotic cocktails, light sandwiches and desserts are served while you relax under the sun. Santa Marina offers fully-equipped conference rooms with natural daylight and capacity of up to 200 guests. There is a Business centre in the complex as well. All office services are at your disposal – computer, printer, fax, telephone line, Internet access.